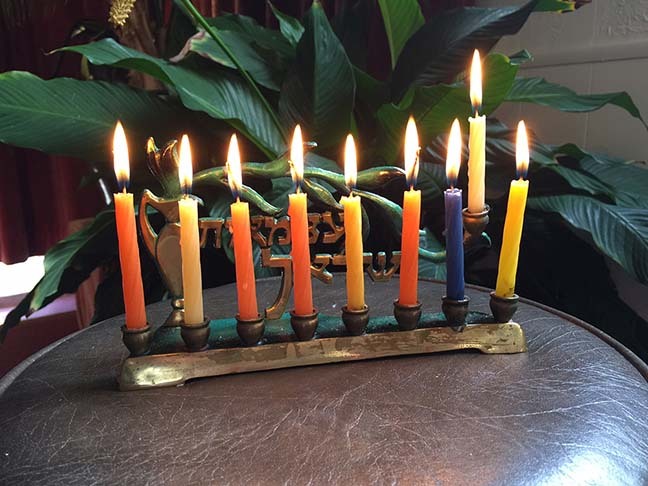 On December 6, 2015 the first day of Chanukah, Rev. Tony Ponticello addressed the congregation at the Community Miracles Center for the Sunday Service. What follows is a lightly edited transcription of that talk. Thank you all for being here. Welcome to December; welcome to the holiday season. It is very nice to be here. 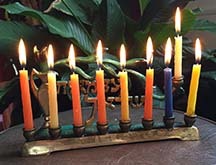 Chanukah — this is the first day of Chanukah. More accurately this evening is the first evening of Chanukah. You usually don't light the menorah until the evening, but all my Jewish friends have always been very forgiving of me (laughter) for lighting the menorah during the day. As I said it is the first day of Chanukah and we will light the menorah in just a moment. I have recently emerged from a particularly dark time. I have these episodes from time to time. This one was very disturbing. However, it seems to have passed, and I've been in good spirits, especially since Thanksgiving. I think being with everybody, and having that wonderful Thanksgiving dinner was part of my healing from that. I really do want to thank the whole Community Miracles Center community for being very supportive of me through my dark time and truly being part of my recovery. Back to Chanukah. Chanukah celebrates a time in 165 BCE, which stands for “Before the Common Era.” We don't say BC, meaning “Before Christ,” anymore. It is not seen as being politically correct because not everyone is a Christian. People have gone back to a way of designating the years that actually has been around a long time. Modern people didn't create it, but they just have found this was a politically correct way of saying the year. In 165 BCE the Jewish people reclaimed their sacred Temple at Jerusalem, and that was a big deal back then because the Temple was the center of the whole Jewish faith. Not just the Jewish faith there in Jerusalem, but the whole Jewish faith that was spread all over the land. There were certain rights and ceremonies that could only be practiced in that particular Temple. There was a certain priesthood that served that particular Temple. So it was a big deal that the Jews didn't have their Temple. What had happened was the Syrians had taken control three years earlier, and they had outlawed Judaism. The Syrians pushed all the Jewish people out of the Temple. They took over the Temple. They erected a statue of Zeus in the Temple. They still did animal sacrifices, but it was okay for the Syrians to sacrifice pigs. The Jewish people felt that pigs were unclean, so their Temple was being further desecrated by having pigs sacrificed. Somehow pigs are much different than lambs. I don't quite know why that it so, but for Jews lambs could be sacrificed but pigs not. I think celebrating Chanukah is a great symbol and a great analogy for our own times and our own lives when we feel “fuel-less,” when we feel like we just don't have the stuff. When we feel we just don't have the fuel we need to push forward. We need to light the lamp anyway, to push forward with whatever little, tiny bit of fuel we have and to trust the process — just to trust the process. You need to trust that if you get going, something will happen and the fuel, that energy that you need, will be there. As I said, I recently got through a time when I felt particularly “fuel-less,” and there were times when it seemed actually impossible for me to even get out of bed, not because I was so low and melancholy. How it manifests with me is I that am just too scared. For me it manifests as extreme anxiety. I am just too terrified to get out of bed. I mean it's really, really difficult. When it hits me hard I sometimes feel like I just can't do it, and I have to call certain people, Reverend Dusa Althea, my sister Sara or other close friends. Then, just hearing their voice and having them talk to me somehow, I am able to get out of bed, get some coffee, take a shower, and start my day. But it's really, really difficult. However, I always was able to light the lamp and get moving — many times with the help of friends and loved ones — and start my day. Even though I felt “fuel-less,” somehow the fuel was there. I always came into work, and did what I could, which sometimes wasn't a whole lot. (laughter) But I was here. I did what I could and got through that time. Im really, really grateful. I've had these episodes of mental health challenges now five different times in my life. The first one was in 1980. Then 20 years went by without one. Then I had one in the year 2000, one again in the year 2008. Then I had sort of a strange one that was at lower intensity, but lasted for a longer time in 2010 — that was when Rev. Larry passed. Now I've had this one that lasted a couple of months in 2015. These episodes have always defied diagnosis. I have doctored for them; I have gone to psychiatrists. I've had a whole variety of diagnoses, so we don't need to get into that. Nobody really knows what happens to me, except that I get incredibly anxious and don't sleep. Then it gets really, really hard to function. Then there is what is called a depression that gets associated with that. I really want to thank, not only the congregation, but especially my Board of Directors here at Community Miracles Center, who were especially very, very supportive. They could have called me to step aside, at least until the episode was over, but no. They had faith in me and my ability to find some fuel, to get through this time, trusting that it would pass. It does really seem to have passed. I think it's important to challenge our notions of what we're willing to talk about and what we're not willing to talk about, because we're all in this together. Everybody has stuff, and everybody has issues. It's very hard to truly heal them if you're thinking you're in an isolated bubble. We heal them together. Everybody is truly a part of us and why hide something from ourselves anyway? Could we even do that if we tried? If we hide it from others, we are hiding it from ourselves. I challenged the hiding idea. I want to be an example of not hiding mental health problems, and that's why I am putting it out there the way I am. There are many teachers in the spiritual marketplace. There are many teachers in the A Course In Miracles marketplace that continually put themselves out as rather enlightened. They talk about how peaceful and joyful they are, and how transformative A Course In Miracles has been in having them be in this state of peace and joy and certainty. So they are the teachers for the enlightened. And I think that's great. But I tend to be a teacher for the unenlightened! (laughter) I actually think that's a much bigger market. I hear the enlightened teachers and I like them, but something about their teaching misses the mark for me. I'm not there. I still have my struggles. I would rather hear about people who have struggles and how they got through them. I would rather hear how students are using this material to get through their own dark times, or fearful times, or down times, or depressed times. That actually means more for me, because that's where I am. Every time I've had one of these big mental health episodes in my life, they are very personally transformational. I think they are for everyone who goes through them. You emerge not quite the same as you were before. You have a certain change, or a certain learning. I'm still consolidating what I learned, but I know part of it is to truly trust my brothers and sisters who are one with me, that I cannot do any of this stuff alone. I cannot do my own personal healing work alone. I can't do the work here at the Community Miracles Center alone. Thats why I'm so grateful for our new Assistant Minister, Rev. Kelly, who just started working here December 1st this past week. I'm also grateful for all the people who helped throughout this time. I am grateful for Rev. Judy and Rev. Brad who came in and did things and still plan to do things. We'll see how that all shakes down. Rev. Dusa Althea and everybody who did some volunteer work. Rev. John and Evan have helped for years. Rev. Roxie helped a lot these past few months when I needed it so much. Certainly, as I have already said, I thank the Board of Directors — all the other people who helped. I think that's really part of the transformational learning. I need to ask for help. I need to understand that not only can I not do it alone, I'm not supposed to do it alone. Working together is a big part of what the Community Miracles Center is, and more of what we are evolving into — to truly be a healing community. We are a community of teachers and ministers, and of parishioners, making our healing work known in the world. About a month or two ago, we had a little power outage and the phone answering machine shorted out. When the phone answering machine shorts out the outgoing message goes away. I never got around to recording a new one and after I knew Rev. Kelly was coming I said to myself, “I am not going to record a new message. For 29 years people have been calling up and listening to my voice. I'm going to have Rev. Kelly record the new outgoing message.” (laughter) Which she did. If you call here now, you don't hear me. (laughter) You hear Rev. Kelly. Some of you will be very glad about that, you won't hear me doing goofy things and singing songs. (laughter) My Board of Directors actually told me a couple of years ago I wasn't allowed to sing songs on the message. (laughter) It was very humiliating. (laughter) Anyway, now you'll hear Rev. Kelly's wonderful voice. A Course In Miracles says, “I trust my brothers, who are one with me.” (OrEd.WkBk.181) I think that's part of what I have truly learned as I went through this “fuel-less” time in my own life. My lamp stayed lit. It stayed lit with the help of all my brothers and sisters, which is probably how the lamp in the Jewish Temple stayed lit too. Think about it. It wasn't that they didn't have any oil to burn in a lamp, there was lamp oil all over the land. People probably just added a little (laughter) when nobody was looking. (laughter) So what it wasn't the consecrated, holy oil. Who cares? You know, the lamp stayed lit! That was the important thing. Trusting our brothers and sisters who are one with us is part of all of our healing. It's part of what keeps our own light going and our own lamp lit. The Temple light stayed lit for eight days, and I had eight weeks of a pretty dark time. But my lamp stayed lit for eight weeks because of all the help from my brothers and sisters and all the help from the Holy Spirit who was inspiring my brothers and sisters to help me. A Course In Miracles says “The teachers of God have trust in the world because they have learned it is not governed by the laws the world made up. It is governed by a Power Which is in them but not of them. It is this Power that keeps all things safe.” (OrEd.Mn.4.3) I think 90% of A Course In Miracles students and most of the teachers have missed this. The teachers of God have trust in the world, trust in the world. Most teachers and students are all about getting away from the world. They think the world it just a manifestation of the ego. The world is crazy. I don't really want anything to do with the world. But we have to learn to have trust in the world, because the world really is just us. It's just us. It is just our manifestation out there, and we need to have trust in ourselves and the light within us, and that light is manifested in the world too. We have to have trust in the world that our light will shine back to us. Another quotation that has always meant a lot to me that says something very similar is “Thus is your healing everything the world requires that it may be healed. It needs one lesson which has perfectly been learned. And then when you forget it will the world remind you gently of what you have taught.” (OrEd.27.49) I believe it is like “banking” our healing in the world. When we are doing well, when we have miracles and transformations in our lives, proclaim them loudly into the world. Be a witness to those healings and share them. Share that energy. Share that light; share that healing. You are banking it. You're putting it in the bank, or as A Course In Miracles says, you're putting it in the treasure house or the storehouse. A Course In Miracles refers to the treasure house or a storehouse many times. It says, “My treasure house is full, and angels watch its open doors that not one gift is lost and only more are added.” (WkBk.316.1) Our healing manifested and witnessed is put into the treasure house. Any blessing that anybody else ever gives us, especially if it is witnessed and acknowledged, gets put into that storehouse. Then when we need it, that “currency” is all there in that bank because we put it there. Then when we're in need the world just gives it back to us. So don't hide your light under a bushel, as they say in many faiths — proclaim it! You are not just proclaiming it for the others, you're proclaiming it for yourself. When you have down times the world will give it back to you almost without you doing anything. That's just the way the process works. That's why we can have trust in the world and that's something we truly need to learn. It's not about pulling away from the world, its about engaging with the world in a very different way. Those students and teachers who bad mouth the world — which is I think a majority of them — they think the world is governed by the laws that the world made up. Thats what they've identified. They are not challenging those laws. But the world is not governed by the laws that the world made up. The world is governed by a divine process that is in our minds. The world is a projection of our minds and the divine is in our minds. “God is in everything I see, because God is in my mind.” (OrEd.WkBk.30) We can trust the world if we have done our part. The world will help us every time we need the help. This article appeared in the November 2015 (Vol. 29 No.9) issue of Miracles Monthly. Miracles Monthly is published by Community Miracles Center in San Francisco, CA. CMC is supported solely by people just like you who: become CMC Supporting Members, Give Donations and Purchase Books and Products through us.